That old adage "from the frying pan into the fire" sums up Bill Johnston's flight to the US. The War of 1812 seemed to follow him. The British invaded Sackets Harbor on May 28, 1813, just days after Bill settled his family there. Most of the American fleet had sailed away to attack the British near Niagara. British General Sir George Prevost chose that time to attack. On the 29th, his troops landed at Sackets Harbor. Fierce fighting ensued, with cannon fire and musket volleys from both sides. The British troops advanced well into town but couldn't dislodge the Americans. Prevost despaired of victory and called a retreat. As was typical of the War of 1812, both sides claimed victory. Bill later recalled how his four-year-old son Jim marveled at the grapeshot hanging from posts and stumps, and how he filled his pockets with spent musket balls. Under Commodore Isaac Chauncey, Bill became a river marauder. He and several naval officers gathered crews of American river men. They scurried about the Thousand Islands and the eastern end of Lake Ontario spying and attacking bateaux carrying British supplies to Kingston. Aside: The naval officers working along side Bill included William Vaughan. Twenty-five years later, Vaughan turned against Bill and relentlessly hunted him though the Thousand Islands. The American privateers traveled in gigs powered by six oarsmen. Narrow and built of light wood (cedar mostly) they moved fast. When chased by British gunboats, Bill's crew could maneuver their gigs through tight channels or portage their boats across an island to the other side. Bill's favorite gig, the Ridgeley, had a long-barreled rifle mounted on the bow. Essentially a thin cannon, it could hurl a one-inch ball nearly a mile. In November of 1813, 7,000 Americans under General James Wilkinson headed down the St. Lawrence in hundreds of Durham boats to attack Montreal. Wilkinson rode in Bill's gig. The British regulars and Canadian militia dogged the Americans along the shore and in boats at their rear. The Americans landed to engage the pesky Canadians. Though outnumbered, they defeated the much larger American force. This encounter, known as the Battle of Crysler's Farm, forced the Americans to abandon the assault on Montreal. Aside: The British force at Crysler's that day included a young sergeant named Donald McLeod. Though Bill's enemy that day, 25 years later he was at Bill's side during his signature event, the destruction of the Sir Robert Peel. 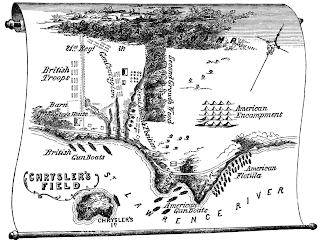 Historian Benson Lossing in his 1869 book, Pictorial Field-Book of the War of 1812, wrote the following in the footnotes to Chapter 29: "Johnston was well acquainted with Chrysler (sic), and tried to get the army below his residence, that it might not suffer during the engagement that seemed inevitable. During the battle, Johnston carried powder from the boats to the dragoons, who delivered it to those in the fight. It is well known that General Wilkinson indulged too freely in spirituous liquors. Johnston assured me that, at the time of the battle, the commander-in-chief was so intoxicated ("indisposed," as charity phrases it) that he could not leave his boat." The American command fell to General Leonard Covington. He died in the battle and Bill carted his body home in the Ridgeley. With the coming of winter, both sides pulled back their armies and berthed their ships until the spring of 1814. Bill spent a few quiet months in Sackets Harbor with his family. Go to first article in Bill Johnston series.